Choosing a good brush to groom your dog is not as easy as it sounds. There are a lot of great and a lot of not so great brushes out there. Chances are your goal is to buy a quality brush that doesn’t cost a fortune and lives up to its promises. SleekEz’s design is based on the premium high-carbon patented wave pattern blade. 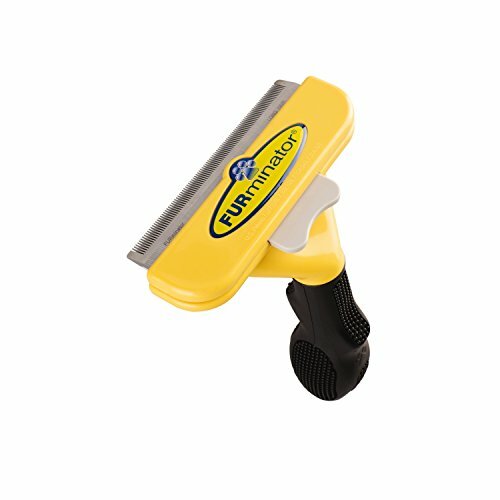 This blade gently breaks up the toughest knots and tangles and loosens any dirt that may be causing mats and issues for your dogs’ coat and skin. Made to be ergonomic and grip-friendly. This poplar wood handle fits comfortably in your hand even with a skittish dog or during long grooming sessions. Eliminates up to 95% of shedding in your house. This also saves you time and money on cleaning and increases the lifespan of the air filters in your home. Multi-Purpose brush removes pet hair from furniture, cars, blankets, and more. Excellent for dogs that do not tolerate metal bladed brushes well. Although this is still a quality metal bladed grooming tool it is designed to be much more gentle. Comes in three sizes to accommodate any dog. Some pet parents get a medium or large Sleekez and a small as well for getting hard to reach and smaller areas on their pooch! This is the medium sized SleekEz which is usually about the right size for most dogs except toy or very small breeds. 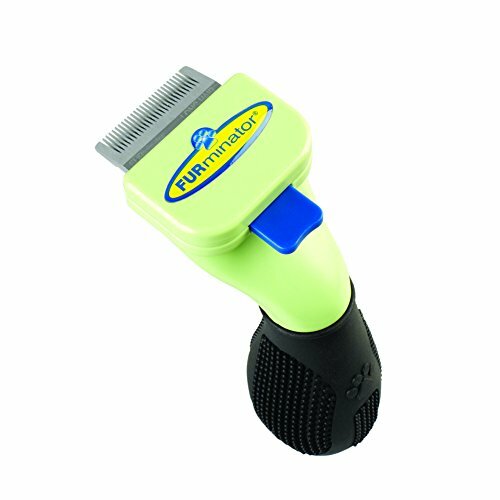 This small SleekEz is suitable for small to medium dogs or for getting some areas on larger dogs that are hard to reach using a big brush. This 10 inch SleekEz is normally used for horses but if you have a giant breed dog then it is worth considering. I still think you will need one of the smaller brushes to get some spots and get the most out of your grooming time together. Stainless steel blade reaches through top coat to get deep down trapped undercoat hair. FURejector button allows collected hair to be released so you can get through grooming faster since you don’t have to manually clean every time you get a build up of hair. Ergonomic handle for comfort during long grooming sessions. With proper use, you will remove loose hair without damaging the coat or skin. Might still irritate dogs that don’t like metal blades or combs. This is a traditional shape and style so if your dog has issues with others that are similar, they may not like this brush as much as you would hope. This Furminator is designed for long haired dogs that weigh 51-90 lbs. This is the short haired version of the Furminator for large dogs 51-90 lbs. This is the extra small Furminator for short haired dogs. I can see having one of these for grooming large dogs too because some dogs have areas that are thinner coated than others and the larger brushes may also be hard to use in some areas of your dog. The truth is that these are both great tools. Saying one is better than the other is pretty impossible when you consider that all dogs are different. Some pet parent’s may not like the shape of the Sleekez and prefer the ergonomic and traditionally styled Furminator that is super easy to clean. I have to say that both of these brushes are very affordable so you may just want to get both and see how it goes. You can always give the other to another dog lover if it is not the right one for you. If your dog has sensitive skin or you have multiple dogs with different styles of coats then I would advise you to get the SleekEZ because it is designed for coats of different lengths and thicknesses.